birthday cake, a photo by eatzycath on Flickr. 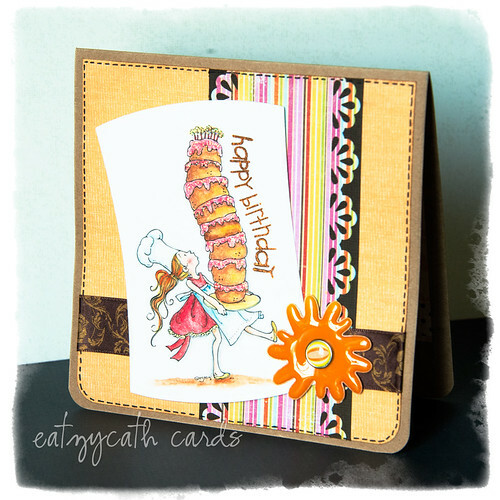 now if only birthday cakes were all so totteringly high and sinfully yummy ... this was such a great image for coloring, especially the cake layers, and the pink glitter on the icing made all the difference for this card! Card was meant for submission for Challenge #199 (Happy Birthday) on Mo's Challenge Blog, but sigh.... as usual - I was too late, missing the deadline by minutes!! Little baker girl with tall cake is a digital image from Mo Manning (she's a very talented artist and illustrator) - check out her images for sale at Mo's Digital Pencil.